Good evening! I shared the Zoya Innocence Collection yesterday, so today I wanted to share some art I did. I would categorize this as an art fail. Lately, I feel like I've lost my mojo with art and just need to reboot. Anyway, I had tried to do a dry marble and it turned into a smoosh mani out of frustration. Zoya has a new spring collection out and it's called Innocence. I don't know why it's called that but there's 4 cremes, a slight shimmer, and a polish I can't really describe. These 6 colors are available now and you may have already grabbed them with all the awesome promos they have had recently! And I just scooped out on their site a new sugar scrub deal. I love sugar scrubs. I shared the Polish Pickup offerings yesterday and today I have a few Indie Pickup/non-polish items! Indie Pickup is now at the same time as Polish Pickup so it makes for easy shopping. Tonight I have two scrubs and a wax melt, so let's get to it. Polish Pickup comes back this Friday, March 1st and this month's theme is Album Covers! I don't even look at album covers anymore which is sad because the art used to be so amazing. Remember epic music videos growing up? So different these days haha. Well, I think makers had a lot of fun with this: so many finishes and colors. YES! Happy Friday! Any fun plans this weekend? After two weekends of being sick, I'm ready to go out and do something fun but of course, the weekend calls for two days of rain. I'm thinking it'll be a great time to see some new exhibits at the MOMA! Speaking of art, as you know I love to do nail art, so this clean up brush from KBShimmer is a great addition to my nail art tools. Hello everyone! I knew this week was going to be a doozy and I wouldn't have a chance to do my nails until Friday (maybe--because I'm getting a big batch of papers to grade today!). So I wanted to put on some nail art that I could wear all week. I shared individual swatches of the Morgan Taylor The Color of Petals collection yesterday, and today I'm sharing the art! It's time to start showing off spring collections! Yes, it's February and cold, but these brighter colors will have you prepping for flowers and picnics! The Color of Petals collection has 6 colors, but I only received 5, and my press sample information says 5. I do see six colors on the website, but only 5 are available to buy, so there must be a production slow down on that sixth color! So I'm sharing the 5 available to purchase now! Today I'm sharing a reformulated whipped body butter from Alter Ego. This is a luxurious body butter and if you're dry, this is something you'll definitely want to check out! This product will only be available during cooler months, so you'll want to grab this before it gets warm. 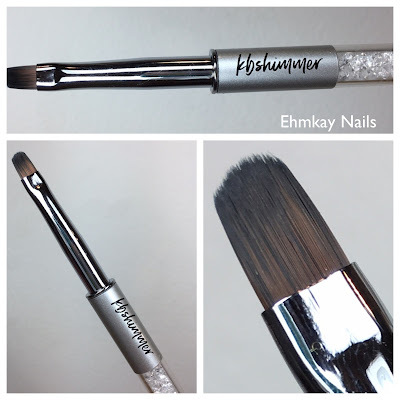 I posted the Jessica Cosmetics Holiday Glam Trio back in December and I knew I wanted to return to the colors later on. I had originally intended to do a few Valentine's Day looks, but alas, I was (and am) still recovering from whatever awful winter sickness I have. I did manage to get myself to do this simple gradient that I really wanted to do! I don't know why, but I was craving a gradient between these two colors once I saw it. It's my current mani too! Well hello there! I took a few days off from the blog somewhat unintentionally. I had so much cute Valentine's Day art I wanted to do, but I've been horribly sick since last Tuesday. I started to feel it come about but tried to pump myself with immunity boosters and such, but I succumbed to sickness. That means I've been wearing the same manicure for over a week, and nails just weren't a priority. Whomp. I feel like as far as holiday nail art, after Valentine's Day, I don't do too much! But anyway, here's one I've wanted to do and it was so simple. 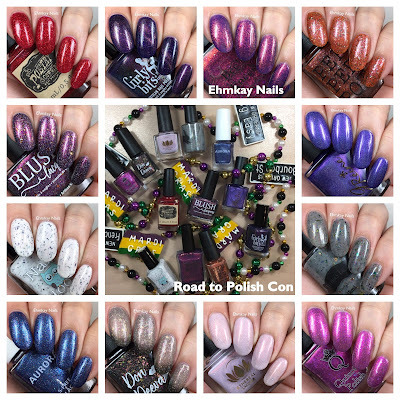 April 6th may seem far away, but it's right around the corner to Polish Con in New Orleans! I shared with your Road to Polish Con Group A last month, and now it's time for Group B! If you missed out on Group A, you can still buy the entire catalog if you want! All 25 colors! But if you can't swing that, check out these 12 that feature a gorgeous mix of finishes that are all inspired by New Orleans! Head to the end of my post for where to order and how you can attend this event! Last month I shared with you my review of Humboldt Soap Company's Cremeplexion, a whipped facial moisturizer. I am still using it daily and my skin is loving it. We experienced that polar vortex and that worked well and my body was in desperate need of more moisture. In comes the new body mousse! Same fabulous whipped texture, but in scented all over lotion. What's a little grade school love like love notes and doodles? I don't doodle on notebooks these days, mostly because I'm on the teaching end of the classroom LOL, but I still like to sketch every now and then. As a student though, I definitely could get lost in fun doodles, and so that's what I have today! Another color of the month! It seems more and more makers are created colors of the months so they have a nice creative outlet. Unlike other brand's, Alter Ego's is available until sold out. This month is a super bright neon red-orange! Let's get to it! I turned the calendar and noticed Pusheen was in love so I stepped it up and did my Pusheen manicure early this month! 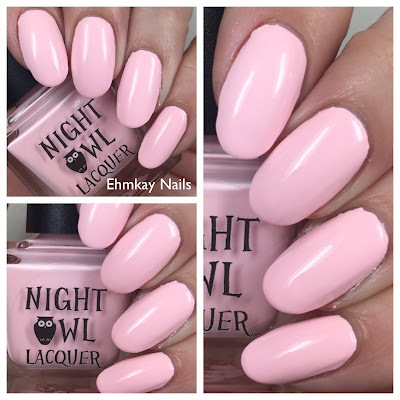 I swatched Night Owl's creme of the month last week (and posted it yesterday) so I wanted to put it back on. It was the perfect pastel for this Valentine's Day Pusheen! Today I have an NOTD featuring the Night Owl Lacquer creme of the month! Not sure where I've been, but I just discovered this brand does a creme of the month, but they aren't limited! Yay! It's so stressful to miss out on all these limited monthlies. For February, the month of love (or I'm calling it that for Valentine's Day), there's a great pink! Let's get to it. When I see this duo, I sort of think of a pro/anti Valentine's Day duo! LOL. I don't sway either way for the "holiday." I like a cute card, a home cooked meal, and that's all. There's nothing worse than paying for a pricey prix-fixed dinner (which most of the time, I can't eat as a vegetarian), and then being rushed out. But I like flowers and a card LOL. So basically, I need to gradient these colors and be a bit of both pro and anti-Valentine.